Material: Crystal glass made by hand and mouth blew. 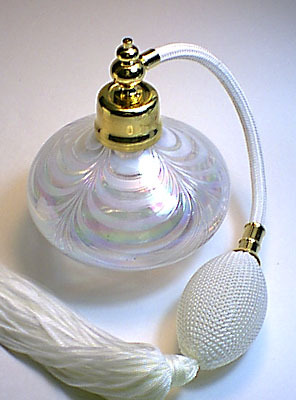 Size: 90 mm x 90 mm x 105 mm ( 1 inch = 25.4 mm ) Finished: Crystal glass in white Opaque decor and bright colored with white tassel spray mounting. Feature: Perfume refillable. Presents for all occasions. Small funnel attached and packed with colorful box.